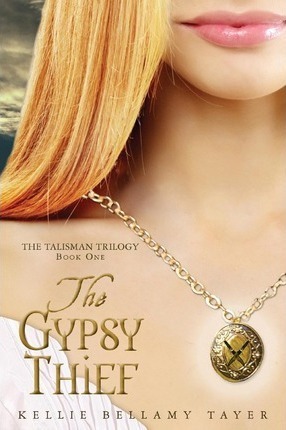 The Gypsy Thief is set in modern day Rhode Island and is the story of Laura Calder and her love for two boys: Andrew Easton, a descendant of King George the First, and Miguel Dos Santos, a mysterious gypsy who has royal ties of his own. More than 300 years previously, a dying Portuguese princess named Gabriela cast a gypsy curse on King George the First who issued a royal decree to counteract that curse. In the spring of 2012, the time has come for the decree to be fulfilled: Miguel Dos Santos must die by the hand of Tristan Easton, the eldest son of the Duke of Easton. But when a tragic accident befalls Tristan, it is up to his younger brother Andrew to carry out the decree, a situation complicated by the fact that Miguel once saved Andrew's life. Andrew's father, the Duke of Easton, aware of Miguel's act of bravery, decides to let him live, but not without cost. He forces Laura into an impossible situation in order to save Miguel and her family. She must make a life-changing, heart-breaking decision, even as she tries to understand the messages from the mysterious disk she wears as a talisman around her neck, a talisman she must protect from the duke, as it is now her only tie to Miguel. Ultimately, The Gypsy Thief is a story of family honor and the lengths we will go to protect the ones we love, a story to be continued in its sequel, The Dark Prince, and concluded in The Shadow King. Kellie Bellamy Tayer is a resident of Shaker Heights, Ohio. She has worked as a journalist for the Des Moines Register newspaper in Iowa and for the Sun Press newspapers in Cleveland. She is a graduate of Ohio Valley College and also attended Kent State University. She is the author of three previously self-published romance novels. Kellie has two sons, one daughter and one grandson.